At the top of the stairs was the usual early March scene at a Boston yoga studio: dozens of sturdy, warm boots, nearly identical parkas (mostly black, and if not, definitely some sort of practical neutral color) and a lot of hats showing pride (New England Patriots) or hope (the Red Sox). A few of us arrived at the same time and Victoria commented on the weather being warm and nice. It’s cold. It’s snowy. It’s Monday. And, no, it’s nothing at all like India. And while I loved my time there (I still have more to say about it here), I’m really, really glad to be home. I’m trying to make the most of my last few beach days before heading home. Part of me feels like I should hop in a taxi and go see some sights, but when I’m on a tropical beach any time spent away from it feels like a waste. When I beach, I beach hard. Today was a little yoga, breakfast (coffee and granola - I try to pick a new thing each morning), a few walks along the beach, my daily mini-bottle of Coke, and a little swimming (okay, less swimming or more like letting the waves knock me over) in the sea. I also took a bunch of photos today - this is one of my favorites. I’m staying at the Yab Yum Resort. (Say that without giggling, right?) Here’s a quick look at what my beach jungle hut looks like. “Hi, ma’am. Do you want a manicure? Pedicure? (I shook my head no.) No pedicure? You sure? How about. pedicure? I massage your feed and paint your toes a pretty color.” This particular woman repeated the offer not once, not twice, but THREE times, as if I’d been going through life not knowing what a pedicure was. To be fair, my feet are looking plain and maybe a bit rough, fine, but I didn’t think there were gruesome. I mean, they’re not so bad that my sisters would take one look at them, hand me $30 and politely tell me to just get a goddamn pedicure already. The best sales pitch of the day, hands down, goes to the lady who tried to sell me on her threading services. “Hi, ma’am. (Taking a look at my legs.) I do threading. Do you know threading? Hair doesn’t grow back for weeks. Very good. You need. She pointed to my legs. I didn’t look up. She kept going and tried to seal the deal by motioning to her chin, as if she was stroking a beard. I can thread here, too. Yes? Shut the front door, I thought. Did she just call me out on having some chin ZINGERS? Great. Awesome. You know what a ZINGER is. They are those random, wonky single hairs that pop up in unexpected places, like the shoulder or chin, or that one weird corkscrew curl in sea of otherwise normal eyebrow hairs. And no matter what the person desperately wanted me to buy, the offer always ended the same way. I have a feeling they won’t be back, but if they return, I’ll be braiding the hair on my pasty white legs and stroking my beard when they see me. What does a yoga dropout like me do on the last day? Sleep in and skip practice, that’s what. It wasn’t intentional. My plan was to go, to finish on a high note, but after getting a phone call at 3am I was awake for a bit and by the time 4:30 am rolled around, I knew I was still quite tired and probably not in the best shape to get up and wait for over an hour in that queue one last time. The rest of the day was a low key. Since tomorrow is will likely be a pretty long travel day - 12 hours, thereabouts - this was probably for the best. 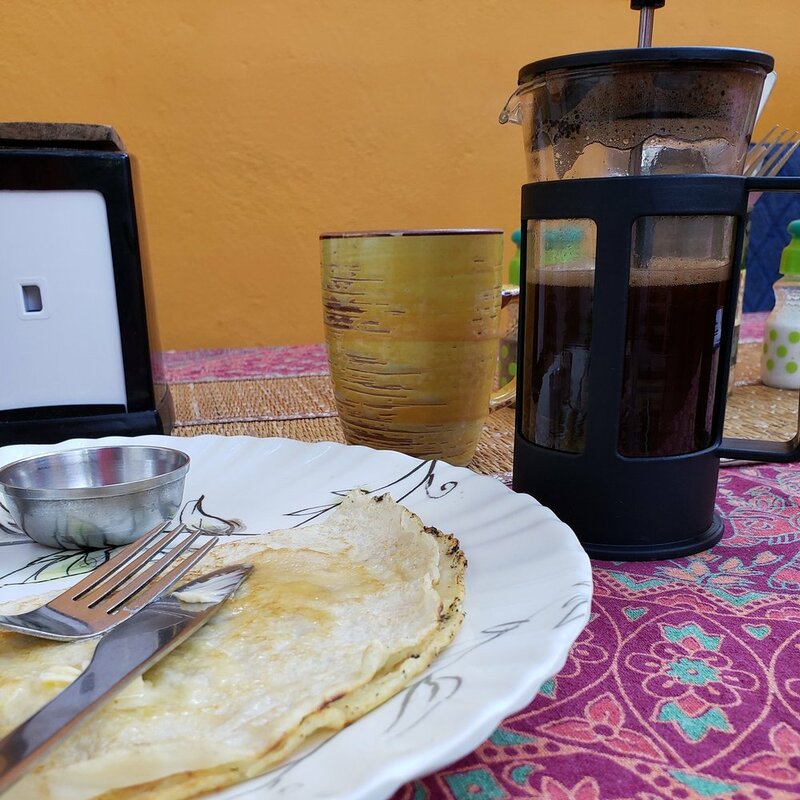 I started the day having coffee in the new outdoor lounge at Anokhi Garden, catching up on things like backing up my photos, posting videos to YouTube and updating my Instagram stories. I didn’t blog every day like I’d thought, but I did get into the habit of creating daily stories, which I’ve been enjoying doing. Later I bought a pair of harem pants (for the beach, I told myself), dropped off the books I’d finished at Depth ‘n Green and had one last double Americano (my favorite), and then packed up everything I brought and bought. Some of the books I read while traveling and am leaving behind in Mysore. I haven’t enjoyed reading this much in literally years. Feels good to get back in the habit. Werner (the owner) and Hannah (one of the guests staying here, a really lovely woman from the UK) both enjoy practicing with Vinay at Prana Vashya Yoga. Hannah is doing the intensive, with practice sessions in the morning and evening. The evening focuses on backbending; the morning looks to be similar to the Ashtanga primary series, but seems to be modified for each student based on their needs. Werner practices there often and likes all of the instructors. Hannah also has nothing but good things to say about the intensive she’s doing - the classes aren’t at all overcrowded, she’s received plenty of individual guidance from the teachers, and she’s been quite happy with the program overall. If I were to come back for the yoga that’s one I might look into. The day ended Zen Kitchen, with Werner and Lea from Switzerland. Tonight we swapped stories about concerts - our first concert, favorite concerts - and music we enjoy listening to today. On Sundays, the Anokhi Garden and Guesthouse is open for breakfast and lunch, and also hosts a bunch of pop-up shops. Today there was a woman reading tarot cards, a couple of people selling jewelry and statues, another woman selling yoga tops and handbags, and a guy silkscreening t-shirts. Here, he’s creating a dark blue to light blue gradient on a white tank top. Still pretty fun to watch. Favorite photo of the day - I’m not sure, but is this a lotus? I’m looking forward to tomorrow. I’m going to Chamundi Hill with one of the other women staying here. It’s the last bit of touristing I’ll do in Mysore. Since it’s a moon day (meaning there’s no yoga tomorrow, in observance of it). Sunset from the roof of Anokhi Garden Cafe & Guesthouse. It only took me 20 days to post a sunset picture. eating sushi in india :: day 15 :: happy pongol and makar sankranti! I take same route back to the guesthouse after yoga. This morning walk is one of my favorite parts of the day - the air is still cool but the sun is shining, there’s little traffic and I get to say good morning a variety of cows, street dogs, monkeys and sheep. January 3, 2019 - One of the neighborhood streets in Golukam, near the Jois shalas. Many of the houses have elaborate designs, drawn in chalk, on the pavement in front of their gates. Today was the first day I noticed a few women drawing fresh ones in front of the homes. Most of those mandalas drawn in white chalk, but this one clued me in on what made today different - it’s a holiday here in southern India. Happy Makar Sankranti. Or Happy Pongol, if you prefer. Either way, it’s the harvest festival and also a day to celebrate the fact that the days are now getting longer. January 15, 2019 - The process looks like finger painting. She was mixing water in a bowl filled with something that looks like chalk dust, then using her thumb to draw on the pavement. The other thing I noticed is that all the cows were neon…yellow. Even my buddy at Depth ‘n Green. Favorite photo of the Day. January 15, 2019 - Party Cow! The Depth ‘n Green cow, freshly bathed in turmeric and wearing a garland. Hey, girl. Moo. This little guy making 1st Main Road his runway was my favorite. Nothing to see here. Just taking my elaborately dressed cows out for a midday walk. I’m no expert - what I learned about the festival comes from a fast Google search and a conversation with a rickshaw driver. But from what I can tell, today is the second day of the festival and this is the day to thank cattle for all their gifts to people: for milk and fertilizer (thanks for that poop, Bessie! ), for plowing fields and moving heavy things, and ultimately (after dying of natural causes at the end of a long, happy life) leather. Cows are bathed with turmeric water, and that’s what turns any while or light colored parts of the cow an intense shade of yellow. Sometimes their horns are painted bright colors (I didn’t see this), and some wear ribbons and garlands of flowers. Many people honored the cows either by stopping to briefly and reverently touch them, or by leaving bowls of cooked rice and jaggery (unrefined sugar) in front of their homes as an offering for cows passing by. January 15, 2019 - Kids with their festival-ready cow near the Devaraja Market. Wikipedia covers the details and description here. There are some regional differences Scroll down to Karnataka to learn more about how the festival is celebrated here. This Times of India article on Makar Sanskranti 2019 and this one with decorating inspiration for the holiday. The title pretty much sums up the day. I did go to yoga. I’m scheduled to start at 6am, which translates to 5:45am “shala time,” and actually means I start practicing sometime around 7am. During the wait, I listen to an audio book. Wearing headphones probably makes me seem unfriendly or unapproachable, but it makes the wait a lot more bearable. I might get a travel mug and start bringing hot tea or coffee, too. My yoga practice is good. I’m still doing the primary series with dropbacks, with the occasional adjustment from one of the three or four assistants and usually one from Sharmila. Don’t let the word “primary” fool you. Just because it’s called the primary series, it is never easy. It is, after nearly 6 or so years of regular practice, pretty familiar to me, and that’s a big deal when practicing in an unfamiliar room, with new people in a new place. My favorite part is that I’m getting the chance to revisit dropbacks and work on them with a bit. Having a variety of new people help me do them keeps it different and interesting each day. It’s been fun. Most of the students getting direct instruction are beginners just learning the primary series; a few are getting lengthy lectures about doing the intermediate series far too soon, and about the importance of learning to practice safely. The rest of the day was pretty low key. I skipped chanting (again), and headed to Depth ‘N Green for chai and the most glorious egg and cheese sandwich. From there, I decided I was comfortable enough with the area to explore on foot, so I checked out one of the many shops selling oils, malas, scarves and other gifts. Ended up having a cup of saffron tea (amazing) and having a long, long chat with the shopkeeper. I bought a couple of sandalwood bracelets. Then I checked out Sayoga, a shop designed to cater to customers like, well, me: visiting Mysore to practice yoga, and maybe needed some stuff - mat, clothes, and that kind of thing. The way it was laid out reminded me a bit Anthropologie - cute, seemingly random things in random places but somehow felt cohesive and organized. That was my Monday. Pretty low key, but still nice. I still have a lot I want to see.- the sandalwood oil factory, the silk factory, Chamundi Hill and the Nandi Temple. I think I’ll start sharing my one favorite photo from each day, as a way to end each post. Favorite photo of the day - January 14, 2019. Mall beads at Sayoga. I’m such a magpie when I shop, making a beeline for the shiny, pretty things. Yesterday was Saturday, my one day off yoga class during the week. I celebrated by sleeping in, and having French toast with honey, bananas and cinnamon for breakfast. And coffee, always coffee. I know chai is the drink here, but I just can’t get into what is basically a tea latte: hot milk, tea, and spices. Hot milk…I just can’t. Sorry. I’d originally planned to go to Chamundi Hill this morning, but changed my mind when I remember that a couple of guidebooks recommended going during the week, as weekends could get pretty crowded. I ended up doing some souvenir shopping and went out for dinner and drinks with a few of the people staying here. I went to the Silver Nest to check out the jewelry and mala beads. The shop itself is interesting. It has a very small footprint - in fact, it’s a couple of rooms in a house, just off the dining room. One room has displays of beads, brass statues, and a few other things. The other room has a table with four chairs, where you can sit to browse through boxes and boxes and still more boxes of jewelry. The shop owner, Meena, will bring you a box full of bracelets, or pendants, or rings, or - as in my case - pretty much everything. I picked through boxes full of anklets, rings, earrings, pendants (there was an entire box of Ganesha pendants), and bracelets. My visit coincided with the family’s late afternoon lunch happening in the next room. I wasn’t entirely sure what to do - it seems rude to get up and leave, walking through the family dining room to exit. I might’ve felt more awkward about it if a few other shoppers hadn’t come in to shop just then, so I stayed and kept browsing through all the boxes full of pretty, shiny things. Just two of the dozen or boxes I picked through. I stayed so long that Meena brought me some lunch, which was amazing. I hadn’t expected to spend quite so long shopping, so I ended up hanging out at Depth ‘n Green for coffee and what I’m pretty sure was a vegan chocolate chip cookie. They look more tempting than they taste, but I guess I kind suspected that before I ordered it. I finished reading My Brilliant Friend by Elena Ferrante - it was amazing. I’m regretting not having brought my Kindle; if I had, I’d have downloaded the other 3 books in the series. After that, I headed back to the guesthouse planning to call it a day, but the guesthouse owner and a few of his friends and other guests were headed out to The Barge for dinner. That’s it…another day in India, wrapped. I can’t believe I’m nearly halfway through my time here. January 10, 2019 - Okay, I’ve gotten a little behind on the blog, but my Instagram stories are more or less up to date. Most days, I get up early for yoga but I get to sleep in on Fridays since my assigned practice time is 8:15am. It turns out that 8am is prime time for catching these guys. Up until today, I hadn’t seen a monkey. Today, I decided to get down to the business of what I call touristing - going places, seeing things, and generally just getting out and about beyond Gokulam, the neighborhood where I’m staying. It turns out this is pretty easy to do. I downloaded Ola (it’s like Uber or Lyft), and ordered up an auto rickshaw. I visited the rail museum and a local supermarket, mostly because they were close by and if the whole Ola app thing didn’t work out, I wouldn’t be stranded too far from familiar territory. Proof of adventurous touristing below. I won’t lie - the rail museum was hella boring (sorry, train fans) but for the entrance fee of about US $1, I suppose all there is to say is that you get what you pay for. On Saturday I made a few changes to my routine. First, I decided to get around by car instead of auto rickshaw. I told myself that I don’t have to be a martyr to the Lonely Planet or Globe Trekker travel style. It’s hot and dusty here, and a 15-minute drive in an open air rickshaw isn’t exactly comfortable. Rickshaws are less expensive than cars, yes, but for perspective, the car rides I took on Saturday cost about US $1.50 each. Today’s touristing was better. I started out with a no-brainer, and visited St. Philomena’s Cathedral. This was a lot of church. This was my first sort of bigger excursion to an unfamiliar part of Mysore. Super cute spot, right? I have about an hour to kill nearly every morning while I wait my turn to start my yoga practice. This was my was of entertaining myself one morning, rather than counting my space in line over and over. The puppies were still sleeping when I arrived at 5:53 am. It feels a touch warmer than yesterday, so that's a nice change. The line is at the bottom of the two flights of stairs. Two students have already left since I arrived. I guess the whole waiting in line situation is not unlike getting breakfast at The Paramount in Beacon Hill. There's a crazy long line, and you order food while waiting in it. Miraculously, by the time your order is ready a spot opens up at a table. It's a system that defies logic and feels like it shouldn't work, but it does. In terms of yoga fashion, it looks pretty much the same as it does at home. Hoodies. Birkenstocks with socks. Flip flops with socks. Small canvas totes printed with the name of people's home shala. The Chinese women have those socks with the articulated toes - socks that are more like gloves rather than mittens. There are a lot more harem pants here, but not a stitch of tie dyed anything, which surprises me. One woman is wearing this amazing full length windbreaker with a crazy bright, multi color geometric pattern along with a wide brimmed hat. Her sun protection game is fierce and the sun isn't up yet. I didn't expect to see so much Lululemon, but it’s here in force - the clothes and the shopping bags, too. 6:19 am - I just want to go back to bed. 6:21 am - The earliest batch of students is finishing up and a couple of them are chatting while have their post practice coconut waters in the dark. 6:33 am - Daybreak. I’m now seventh in line. 6:40am. Puppies are awake. Yes, I read the article about the woman who died from rabies after a street puppy in India bit her. And, yes, I do keep my distance. I think there are monkeys in the trees...and puppies are barking at them. 6:50am. Dalmation guy, who walks by the same time every day. I wrote most of this while waiting for my turn to practice this morning. I arrived around 5:45am. Another day, another hour plus long wait, outside, to practice. Today I didn't bother comimg extra early to get a good spot in line. Practice and all is coming, as they say...but I'll have to wait my turn first. No cuts, either. Nobody has, but I wonder what would happen if someone did. What I am starting to appreciate are the people who have worked to make yoga accessible and relevant in America. This yoga here, at Saraswati's shala, is anything but. First, it's not cheap. It costs $500 for the month - far more than I would pay to practice regularly at home. It is also time consuming, between the wait and practice itself. The long wait makes me feel unwelcome, like there isn't room to accommodate me. Sharmila seems to feel bad about this; she comes out now and them to check on us. At home, yoga teachers nearly always go out of their way to say, "Welcome." At Equinox, it's very nearly mandatory to introduce yourself and ask students about limitations and injuries they might he working with. Rebecca would always introduce herself, always. I miss this. People come here more than once, sometimes for months at a time, with the hope they will be given authorization, blessings and the a-okay to teach Ashtanga. Paying the tuition and waiting patiently are no guarantee of getting that authorization, either. It's before 6am, and I'm fifth from the end of the line. It looks like I will be practicing with the newest students, ones both new to Ashtanga and new to Saraswati. I hope this means I'll be able to practice without much attention, since the assistants and Sharmila will be busy helping them. There is one guy, right behind me, doing shoulder shrugs and hip circles. I'm guessing he's just trying to stay warm but he looks ridiculous, like a background person in a Sweatin' to the Oldies workout video. On my first day, he was gently scolded for being much later than his assigned 5am start. 6:17am - A dog joined the line. I don't remember seeing this one before. 6:23am - The latest person to the line is the guy who practiced to my left in the hallway at the big shala for yesterday's led primary. We didn't chat, but did have a solid shared eyeball roll and laugh over our exile to the foyer for practice. 6:27 am - Sweatin' with the Oldies just pointed out the line moved forward without me. Whoops. I'm now on the landing before the last flight of stairs. I'm now 10th in line to practice. The guy first in line - the next one in - is balacing his mat on top of his head while he waits for his queue to enter. You don't simply walk into the yoga room. Here, students have to wait for the teacher to acknowledge them before entering. It's sort of like waiting for permission to enter, but not really. It feels like more of a politeness, like saying please or thank you, or addressing a stranger with sir or ma'am. 6:35 am - Daybreak. Still waiting. The girl ahead of me brought a book and is reading. I could probably use the time to listen to an audio book. Maybe tomorrow. 6:40 am - There are 9 or 10 people behind me, and 9 in front of me. Mat on his Head was chatting when Saraswati called for one more and didn't immediately enter. He was pretty quickly and sharply reminded to get a move on by another guy, the one who practiced to my right yesterday in the foyer. 6:46 am - Sixth in line. Twelve behind me. A man wearing a peaky blinder hat, walking a dalmation, just passed by. Okay, then. 6:53 am - Sweatin' just dropped his yoga mat off the second floor landing to the ground below. Good thing it didn't bonk the guy selling coconuts on the lawn. Similar thing happened the first day...a yoga mat fell from this spot. It's owner didn't notice so I stepped out of line to grab it and pass it back up. 6:56 am - Fourth in line. 6:57 am - Third in line. 6:58 am - I can see the whiteboard outside the door with the etiquette rules and announcements. The next moon day isbJanuary 21st. There are 3 people in line wearing socks with articulated toes. I wish I had a pair to wear with my sandals. Mornings are pretty chilly. 7:01 am - I'm at the door. 8:25am - Done and out, and free for the rest of the day. I’m traveling alone, and while I do quite a bit by myself I’m not lonely. In fact, I’ve not been solitary for too long since I arrived. The small guesthouse where I’m staying has been quite friendly. Last night a small group of us headed out to a farewell dinner for a Belgian couple that was leaving the next morning. We went to The Barge, Mysuru’s first microbrewery. The building is constructed from recycled (up cycled?) shipping containers. According to the owner of the guesthouse, it’s a popular spot on the weekends for young professionals and even families with kids, which sounds like a lot of the breweries I know and have seen back in New England. There was a bunch of outdoor seating, and cool booths inside the converted shipping containers. It was not at all something I expected to see while in India, and I’d definitely go back. My assigned practice time is 6am, which means most days I’m here will start pretty early, before sunrise. The queue was pretty long when I arrived yesterday, and I waited over an hour before I could actually get in to practice. Today, the line was much shorter (it started on the bottom flight of stairs) and the wait, less. I won’t lie - the long wait is a drag. Also, it’s chilly. It was around 55 degrees Fahrenheit this morning. It’s funny the things I’ll tolerate here that I wouldn’t at home. The queue outside Saraswati’s shala. The wait to practice on New Year’s Day was more than an hour. Street puppies make the wait a lot more entertaining. Today, they were asleep in a heap when I got in line, and woke up a little before 6am. I’m pretty sure the best part about being on vacation is eating out for breakfast everyday. Cafe Santosha, is where I landed today. It was full of foreign yoga students (I get the feeling I’ll end up enjoying those types of places most). I’m staying at the Anokhi Garden Cafe and Guesthouse, and the gardens are really lovely. See, I told you my coffee situation was well sorted by this point. By the end of this trip, it’ll be interesting to see what I photograph most: cows, coffee, or flowers. Moooooo. This guy was outside the gate of the guesthouse where I’m staying. The jet lag is real, yo. I’ve never traveled across so many time differences and wasn’t sure what to expect when I did. Yesterday and today I felt great until around 3pm. I thought a short nap would take the edge off, but both days I ended up sleeping hard until nearly 7pm. Nap champ! eating sushi in India :: day 1 :: happy new year! I’m spending the month of January in India. 2019 is starting with quite a few firsts: first time in Asia, first time doing some personal travel alone, and first day of the year in a completely unfamiliar place. You might be thinking “You aren’t really eating sushi there, are you?” Nope. Over the holidays, we had a good laugh when Rich’s dad, who spent quite a bit of time working in India years ago, told him about about his colleague who did try the sushi… only to have a hearty helping of regret for dessert. There are probably many wannabe Anthony Bourdains, adventurously eating my way around the world, but I’m not one of them. I’m not an aspiring travel writer, either, but I do want to record the everyday details - where I went, what I saw and what it feels like to do everyday things in a place completely foreign to me. Today started early, around 5am. I’m practicing yoga while I’m here (at KPJAYI with Saraswati). The yoga ID card that stays tucked under the upper right corner of my yoga mat while I practice. Quite a few people already in the queue to practice by 5:45am. Happy New Year! I was done by 8am or so, and walked back to the guesthouse where I’m staying. This looks a bit different than my walk to and from North End Yoga at home. Later, the owner of the guesthouse invited me to join him on some errands at the main market. I experience traffic on the back of a scooter, see the fruit and flower market, and got a first hand look at what it takes to buy a toaster. Shopping here is a pretty social experience. You don’t browse alone. There’s always someone to help you find what you are looking for. A stop at a stationery store included chatting with the owner and his son over coffee. Later, I headed out alone for lunch at a place called Depth ‘n Green. Lonely Planet’s review nails it: “Wildly popular with local yogis, this buzzing healthy cafe offers a menu of satisfying Indian and Western dishes, including great salads, served up on tree trunk tables.” I’ll definitely be back, although if I’m being honest, I’ll probably avoid the groups of yoga students talked about which pose they struggled with or nailed that particular day. A few weeks ago, I attended a networking event for college students at MIT. My job for the evening was to represent the company I work for and talk to students about what it’s like to work where I do. I brushed up on the details of the internship program and considered myself more than prepared. As I made my way across the city, it occurred to me that I was an undergraduate college student 25 years ago. Twenty five years. Here’s a little #tbt of college senior me. Portrait of a future experience design and product manager, though I’d never heard of either of those jobs when I was a college senior back in 1992. Each student I met was accomplished, articulate, and deeply passionate about their studies. Not one lived up to the stereotypes, parodies and punch lines about millenials. Since the event was hosted by the Society of Women Engineers, most students I met were female. Despite the fact I believed them to be more together than I was at their age, many had exactly the same questions and worries I remember having 25 years ago. How did you get your dream job? Was your MBA worth it? Since then I’ve thinking about these questions, who I looked up to when I was a twenty-something student, and what it means for me to be there for the next generation of women in engineering. I wanted to have more answers and thoughts for this post, but after a few weeks of it sitting in my Drafts folders, it’s high time to admit that they’re not yet ready. Today was about karma yoga, the yoga of action: voting. My sweetheart and I headed to the local polling place early so we could vote as soon as it opened at 7am. As we queued up outside with about 2 dozen other people on the sidewalk, we chatted about why we couldn’t just vote via mobile phone and skip the whole standing in line thing. But here’s the thing: I love this part. I like walking to the polls, chatting with neighbors while standing in line, making small talk with the volunteers, and filling out the ballot. I like that the whole process is one I can’t rush, even if I tried. A few minutes before 7, a woman stepped outside and announced that the polls would open at 8. The crowd responded. “Wait, no. It’s at 7!” I might be reading into it, but the collective tone was a little tense - not angry, exactly. More like impatient. The moment passed pretty quickly when she realized her mistake and assured us that the polls would open at 7.
the local polling place in my neighborhood. Some people stop to smell the roses. In Boston, we stop to check out the fall leaves. Part of my walk to the polls follows Boston’s Freedom Trail. Lately, I catch myself rushing. Rushing to finish yoga so I can go home and walk the dog. Rushing to walk the dog so I can hightail it work. Rushing from meeting to meeting. Rushing to get off one plane to get on another. Scrolling through my news feeds to catch up with as many people as I can, as fast as I can. I like the idea of taking the time to stop and smell the roses. ( To take stock of the good moments, successes, and highlights. I did this a couple of times last year by sharing my favorite photos for the month. It seems like a good idea as any for a post, so here goes: some of my favorite moments from October. october 31, 2018 :: sunrise over lake chelan. coffee does taste better with a view. pretty sure I posted a similar photo this time last year, too. october 7, 2018 :: rich and I often joke about living in an Airstream someday. For the longest time, we’d talk about what it would be like, and eventually talk ourselves out of it. Then we met a couple who bought one….and then sold their house. It turns out we have a hard time finding reasons why Operation Airstream Livin’ is a bad idea. october 7, 2018 :: Met this fellow at the Smuttynose Brewing Outdoor Expo. I did not ask him how many licks it takes to get the center of a Tootsie Pop. not a writer. writing anyway! Should I go ahead and rename this blog something like All my Novembers? It has a soap opera cheesiness I kind of like. Maybe Groundhog Month? A quick scan of my posts reminds me that my Novembers are pretty routine, between holidays and my day job of the past eight (8!) years. There’s Thanksgiving and my birthday, a few token photos of Las Vegas, and some pretty foliage. All the same topics last year, and the one before that. I expect this year to be more of the same. Despite the fact I’m not a clever writer nor a consistent one, I still want to try. I had a few pen pals growing up, but lost touch with them after only a couple of years. I corresponded with a girl in Bermuda when I was 10, and with teenagers in Switzerland and Greece when in middle school. I remember being surprised that girls in Europe listened to the same music that I liked, and like me, also worried about grades, boys and college. Seems like a pretty simple lesson, but I remember being really blown away by that at the time. It was fun getting to know people who were just sharing everyday stuff. We all have a lot more in common than we realize. That’s what I loved about pen pals and later, following my favorite bloggers back in the 2000s. I’ve read a few posts lately by bloggers I’ve followed for years and years - more than a decade now, in fact. Many of them are talking about how it felt to write, and to connect with people that became lifelong friends. Checking my feed is like visiting with friends. To me it feels very different than scrolling through a news feed, posts, stories and snaps. Lately I’m finding it incredibly jarring to scroll through a feed that sandwiches some of life’s tragic news in the middle of silly memes, jokes, and advertisements. Feeds provide an experience that’s slower…mindful, even. Maybe that’s what it’s about for me: wanting a mindful online life. Instead of writing and posting daily just because it’s November, this year I’d like to make it about cultivating a mindful online life. where I was today :: eastern Washington, driving to Spokane. November was pretty busy with trips to Seattle and Las Vegas, followed by Thanksgiving. I'd just barely caught my breath before December's trip to Denver, followed by Christmas in Georgia, and now, to ring in a very cold New Year's at home. The days are short and the photos dark, but the lights make everything look cozy. Here's to a new year and fresh starts! A warm pub on a cold night at Christmastime is kind of lovely - Green Dragon Pub in Boston. Downtown Crossing a few days before Christmas. This was the view from my office in Manchester, New Hampshire one morning. Winner, winner chicken dinner! Smoky Chicken with Cauliflower from Smitten Kitchen Everyday. As I write this, it's 6:30 am. Normally at this time I'm on my mat, getting my yoga practice underway, but not today. I woke up tired and cranky. I'll regret skipping practice, I'm sure, at some point later today. When i don't practice, I like to reserve my mornings for something creative or quiet. More often than not, I journal but for today, I'll change it up and write here. Though my writing isn't much to speak of, the ideas I wrote about have stuck with me. I've noticed them in so much of my reading lately. This article about spending an hour a day without a phone is one that caught my attention. This thought in particular stuck out to me. "Even if we don’t adhere to traditional prayer books—most of us don’t these days—the same dynamic, intense focus followed by distraction followed by insight into the stirrings of our unconscious, is key. It’s how many ancient forms of meditation work, and the best way, still, to begin and know ourselves." Meditation: It never hurts, it always helps, it's free, and is still the best way to find and know yourself.